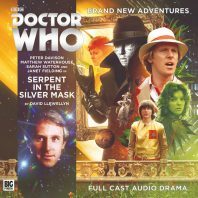 Big Finish’s 2018 Fifth Doctor trilogy comes to a close with David Llewellyn’s evocatively-titled ‘Serpent in the Silver Mask’ set upon Argentia, the galaxy’s most exclusive tax haven phased sixty minutes out of normal time, and opening at the funeral of mining magnate Carlo Mazzini. With the Mazzini family composed of clones of sorts with slight variations introduced to ensure variety and vitality, the assembled family that is much closer visually than emotionally is thrown into chaos when a masked killer begins killing them off one by one. With Argentia closed off behind its temporal displacement field, the Doctor, Adric, Nyssa, and Tegan must discover the identity of the murderer before Argentia is forever cut off from the remainder of the universe. From beginning to end, the undoubted star of ‘Serpent in the Silver Mask’ is Samuel West who is tasked with bringing the entire Mazzini family to life single-handedly. While some family members understandably have bigger roles than others as sole heir Angelo is first killed and the rest sequentially come under suspicion and soon meet their own demise, West proves remarkably adept at choosing slight variations in intonations and dialects to give a sense of development and history to each, whether than be an oafish set of twins who are purposefully grating and have little understanding of the world around them, a more desperate woman who finds her business floundering, or any of the other figures suddenly in line for inheritance with their own motivations. There’s a wonderful sense of dark comedy around the horrific murders, but West is the anchor around which the mystery so centred on the Mazzinis is allowed to naturally unfold. As in the most classic Doctor Who fashion, the Doctor and his companions arrive on Argentia completely unaware of what is about to develop, looking instead to collect a specific crystalline growth present at the junction of real time and shifted time to help assemble a new sonic screwdriver. As the mystery progresses, there are unquestionably elements of the 1949 film Kind Hearts and Coronets in which Alec Guiness played nine roles and the name Mazzini again featured, but the setup and eventual myriad of further developments and revelations bring out aspects of the greatest works of both Agatha Christie and Sir Arthur Conan Doyle. The Doctor has always been written as a Holmesian figure anyway, but Llewellyn takes that aspect of the character to its extreme as he deduces the identity of the murderer far in advance of anyone else but refuses to tell for fear of spoiling what he perceives to be the fun. The Fifth Doctor in particular is often thought of as being one of the most human and empathetic incarnations, but this heightened detachment reinforces the fact that he is just as alien as any other of his selves for better or for worse, and Peter Davison gives a great performance both while throwing himself into the mystery and while pondering if his character has become somewhat superfluous to the three capable companions he now has in tow. ‘Serpent in the Silver Mask’ also manages to achieve the rarest of feats for this particular era, keeping all three companions involved with meaningful scenes as each tackles the mystery from a different angle. Yet while Sarah Sutton and Matthew Waterhouse give extremely effective and emotional performances that recapture their on-screen characters well, it’s Janet Fielding who really shines as Tegan enjoys a more flirtatious relationship with fellow investigator, Joe Mazzini. Indeed, because Samuel West plays so many characters, the supporting cast is actually quite small, but Phil Cornwall as both Superintendent Galgo and the robotic Zaleb 5 along with Sophie Winkleman as stroppy secretary to Carlo, Sophia, help to further flesh out this contained story to grand effect before the Scoody-Doo-eque reveal and the science fiction twist at the heart of the matter become known to provide a fitting conclusion to a very logical sequence of events. Although ‘Serpent in the Silver Mask’ may not have the biggest stakes in Doctor Who history and the Fifth Doctor here goes somewhat against his very caring and open nature, the steady pacing and tone throughout is wonderful, and director Barnaby Edwards keeps the action and intrigue hurtling along from opening credits to close.